Our personal care products range from colgate palmolive toothpastes to toothbrushes. Our bulk packs of small travel toothpastes are great for salesmen traveling and hotels. We stock a lot of travel size options in healthcare including the great crest brand to whiten your teeth. Colgate Palmolive Two In One Whitening Toothpaste - 4.6 Oz. Procter and Gamble Crest Tube Plus Scope Toothpaste 2.7 Oz. 2-In-1 Icy Blast Whitening Liquid Toothpaste - 4.6 oz. Max Fresh Cool Mint Liquid Toothpaste - 4.6 oz. 2-In-1 Strawberry Kids Toothpaste - 4.6 Oz. 2-In-1 Watermelon Kids Toothpaste - 4.6 oz. Listerine Essential Care Mint Toothpaste - 4.2 Oz. Colgate Max Fresh Cool Mint Toothpaste - 6 Oz. Colgate Max Fresh Clean Mint Toothpaste - 6 Oz. Colgate Max Clean Effervescent Mint Toothpaste - 6 Oz. Colgate Max White Crystal Mint Toothpaste - 6 Oz. Ultra Brite Regular Toothpaste - 6 Oz. Colgate Total Advanced Clean Toothpaste - 5.8 Oz. 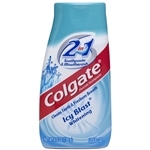 Colgate Anticavity Winterfresh Gel Toothpaste - 4.2 Oz. Colgate Sensitive Plus Whitening Toothpaste - 6 Oz. Colgate Total Toothpaste Advanced White Paste - 4 Oz. 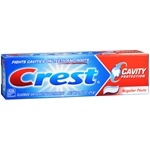 Crest Cavity Protection Toothpaste - 6.4 Oz. Crest Cavity Protection Gel Toothpaste - 6.4 Oz. Crest Tarter Protection Original Toothpaste - 6.4 Oz. Optic White Sparkling Mint Toothpaste - 5 oz. Colgate Optic White Sparkling Mint Toothpaste - 3.5 oz. Optic White Icy Toothpaste - 3.5 oz. Colgate Optic White Enamel Toothpaste - 3.5 oz. Colgate Anticavity Toothpaste Childrens - 4.6 Oz. Colgate Tartar Control Toothpaste Whitening - 2.5 Oz. Max Clean Fresh Cool Mint Toothpaste - 1 Oz. Toothpaste Anticavity Regular Flavor - 1 Oz. Toothpaste Anticavity Regular Flavor - 6 Oz. Colgate Anticavity Toothpaste - 2.5 Oz. 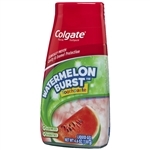 Colgate Regular Flavor Anti-Cavity Toothpaste - 2.5 Oz. Toothpaste Sensitive Complete Protection - 6 Oz. Baking Soda and Peroxide Whitening Toothpaste - 6 Oz. Anticavity Toothpaste Great Regular Flavor - 8 Oz. Junior Toothpaste - 4.6 Oz. Toothpaste Backing Soda And Peroxide Whitening - 6 Oz. Toothpaste Tartar Control Whitening - 6 Oz. Sensodyne Whitening Toothpaste - 0.8 Oz. Sensodyne Extra Whitening Toothpaste - 4 Oz. Aquafresh Cavity Protection Toothpaste - 3.4 Oz. Gentle Whitening Sensodyne Toothpaste - 4 Oz. Extreme Fresh Plus Whitening Toothpaste - 5.6 Oz. Aquafresh Kids Pump Bubble Mint Toothpaste - 4.6 oz. Aquafresh Excellence Whitening Toothpaste - 5.6 oz. Sensodyne Deep Clean Toothpaste - 4 oz. Sensodyne Repair and Protect Toothpaste - 3.4 oz. Parodontax Whitening and Clean Mint Toothpaste - 3.4 oz. Sensodyne True White Extra Fresh ToothPaste - 3 Oz. Pronamel Strong and Bright White ToothPaste - 3 Oz. Sensodyne Strong and Bright White ToothPaste - 3 Oz. Sensodyne Pronamel Multi Action ToothPaste - 4 Oz. Sensitive Prevent and Repair Toothpaste - 6 oz. Anticavity Toothpaste Great Regular Flavor - 12 Oz. Buy small Toothpaste for your hospitality guests or if you travel a lot.